Once as I was flying cross-country over the middle of the United States, the woman in the seat next to me remarked: “You know, in Nebraska when there’s a game in Memorial Stadium, it becomes the third largest city in the state.” I looked down on the plains thousands of feet below us and envisioned some 85,000 people packed into the University of Nebraska’s football stadium rooting for the Cornhuskers. That’s an impressive number of people packed into one place, I thought, but in my research I encounter even greater population densities all the time—on a microscopic scale, in a drop of seawater. A single drop of seawater can contain more than 300,000 organisms, about three times the number of seats in the biggest football stadiums in the nation. These tiny microbes—most of them single-celled and smaller than 0.0001 inches—are the chemists of the ocean. They perform all sorts of important chemical transformations. Some microbes turn dissolved raw ingredients into tasty organic morsels for bigger animals to eat; others break down large chunks of complex compounds back into raw ingredients; some create toxic chemicals to defend themselves, while others detoxify compounds, and the list goes on and on. All together, these multitudinous microbes are invisible cogs in Earth’s machinery, circulating chemicals in and among the ocean, land, and atmosphere. Microscopic marine plants turn carbon dioxide dissolved in seawater into edible organic matter that launches the ocean food chain. As these microbes take up the carbon dioxide dissolved in seawater, it’s possible for more of the carbon dioxide in the atmosphere to be absorbed into the ocean. Meanwhile, other bacteria in the ocean are turning this organic matter back into carbon dioxide in the ocean. The balance between the two is important for understanding how carbon moves through the ocean and atmosphere. So shedding light on the intricacies of what’s happening on the microbial level is a key to revealing how the whole planetary system operates. But that’s a daunting task. The diversity of microbes is immense, and because each type of microbe specializes in a different kind of chemical reaction, scientists spend a lot of time studying which microbes are present in a given seawater sample and what sort of chemistry they’re doing. It would be like looking down at 85,000 fans in Memorial Stadium and trying to figure out how many of them are vegetarian, how many of them drive mini-vans, or how many of them have eaten a corn dog that day. 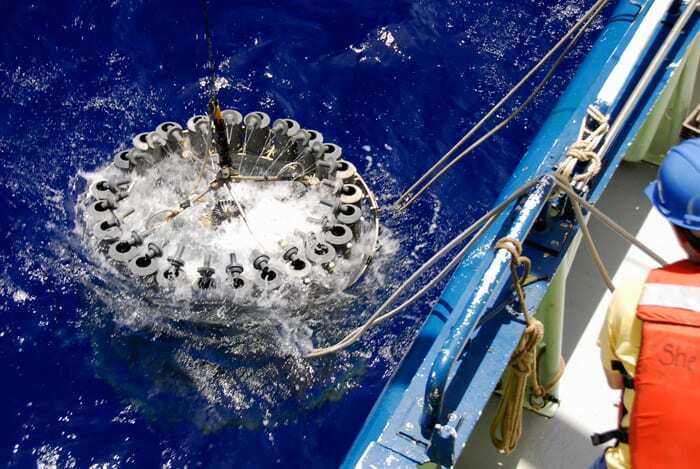 We need new ways to identify which microbes are out there in the ocean and distinguish what they are doing. I am working on developing a new tool to help do that. 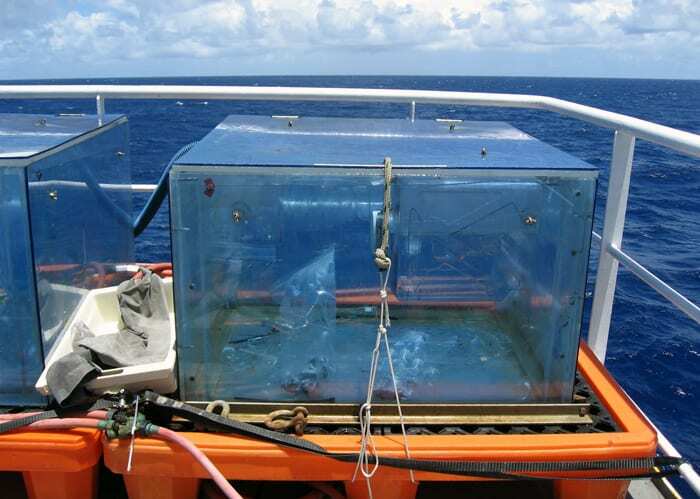 With such a huge number and wide diversity of microbes in every drop of seawater, it’s not feasible to directly determine the identity and chemical activity of each cell in a large sample of seawater. But we can get a broad census of what’s living there by measuring chemicals that were in these cells: compounds such as DNA, proteins, and lipids (or fats). These compounds are abundant in all cells, but individual types of microbes can have specific types of the compounds in them, giving us an idea of which microbes are present. Each type of compound can tell us something different. DNA can reveal the presence of organisms with very specific capabilities. Proteins can indicate the sorts of chemical reactions that are occurring. And then there are lipids, the compounds I’m working on. They offer a unique tool because they can tell us not only who’s there but also how fast they’re growing and doing their chemistry. Having a way to measure how fast organisms are growing is crucial for figuring out the role these organisms are playing in large global processes. I study lipids from marine microbes’ cell membranes—the outer layer that holds cells together and controls what goes in and out. Every cell has a membrane that is mostly made of lipids. In human cells, most lipids in our membranes contain the element phosphorus and are called “phospholipids.” In marine microbes, some membranes contain phospholipids, but many microbes build their membranes out of a variety of other types of lipids, including lipids that contain sugar (glycolipids), sulfur (sulfolipids), or nitrogen (betaine lipids). I’m trying to determine which lipids are made by which types of microbes. If we could do that, we could identify and measure the membrane lipids in a sample of seawater to get a “roll call” of the marine microbes in it. We can also use these lipids to get a sense of how fast particular types of microbes are growing. Every time a cell grows larger or a new cell is made, new membrane lipids need to be manufactured—much the way you’d need to build walls every time you added a room to a house or built a new house. We already have the tools to measure how quickly certain types of membrane lipids are made. But if we could identify which microbes make those lipids, we could also determine how fast those microbes are growing. Combining this information, we could then reconstruct a bigger picture showing which microbes are doing what to move carbon through the ocean. Two major groups of microbes in the ocean play essential roles in transforming carbon compounds and moving them from the surface ocean to the deep ocean: autotrophs such as phytoplankton, which produce organic carbon compounds, and heterotrophs such as bacteria, which recycle already-made organic carbon. Like plants on land, autotrophic phytoplankton use photosynthesis to turn carbon dioxide and water into oxygen and organic carbon compounds. Organic carbon is used to make large, complex molecules and can be used as a source of energy and food by other organisms. So phytoplankton are “producers”— they turn raw ingredients into organic matter. They’re often seen as the base of the oceanic food chain; the amount of carbon that phytoplankton turn into organic matter each year is equal to or more than the total amount of plant growth on land. Heterotrophic bacteria, the “recyclers,” are able to take up organic matter and turn it back into dissolved, inorganic nutrients that can then be taken up again by other producers or other recyclers. These transformative processes—turning carbon dioxide into organic matter and recycling that organic matter for use again—determine how carbon and other materials get used and moved through the ocean. A key to my research is that autotrophs and heterotrophs each prefer to use a different form of carbon. Like adding dye to a stream to see where the water flows, I can add a label—a heavy version of carbon with 13 nucleons (neutrons plus protons) instead of the usual 12—to each group’s preferred carbon source and follow where it ends up. For phytoplankton, I add a heavy carbon label to carbon dioxide dissolved in water. For heterotrophs, I add heavy carbon to glucose, a simple sugar made with organic carbon. 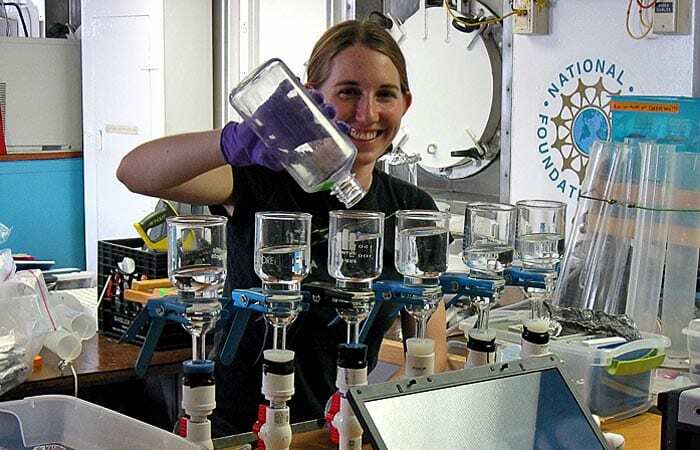 To do these experiments at sea—on a ship in the middle of the Atlantic or Pacific Ocean—I fill a large bottle with about five gallons of seawater, then add heavy-carbon-labeled “food” for either the heterotrophs or the autotrophs and let them do their microbial chemistry. At the end of the day, I filter all of the seawater onto thin plastic wafers with very tiny pores so that I collect nearly all of the cells. Each filter now has more than a quarter of a billion cells on it, the equivalent of the population of 30 New York Cities, yet these cells are so tiny that the only thing you can see with your naked eye is a thin, slightly greenish veneer on the white filters. The next step is to determine what types of lipids were made by the cells. From the collected cells, I extract all the membrane lipids. I get a mixture of many kinds of phospholipids, glycolipids, sulfolipids and betaine lipids—like brown paint made from mixing many colors in the rainbow. 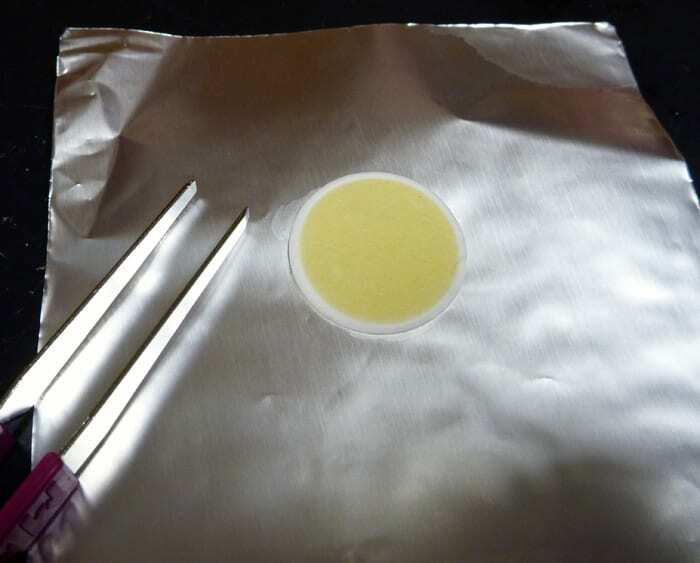 Using a process called liquid chromatography, I can separate out the individual types of lipids from the mixture—effectively separating “yellows,” “greens,” and “reds” out of the brown mixture. Now that I know what was made, the next step is to identify which microbes made it. 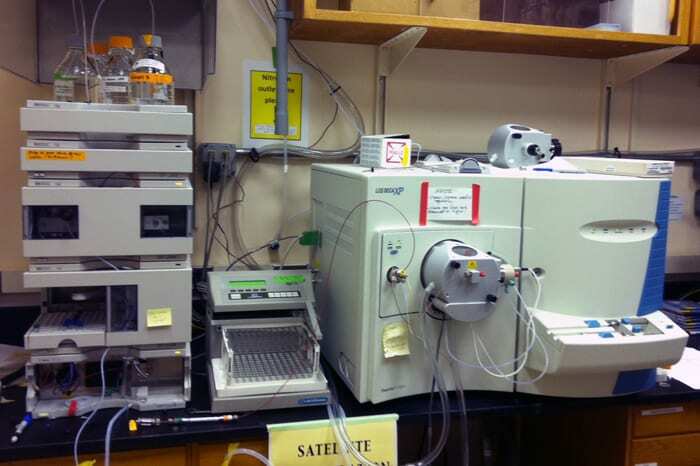 I run each type of lipid through a mass spectrometer to measure the abundance of the heavy carbon label. If I added dissolved carbon dioxide with a heavy carbon label to the seawater and I see a particular lipid with a heavy-carbon label, that tells me the lipid was made by an autotroph. Doing this with glucose and dissolved carbon dioxide, both labeled with heavy carbon, I can distinguish whether each of the lipids I found was made by a heterotroph or an autotroph. In initial results from experiments using this process, I’ve identified one lipid, a type of sulfolipid, that is uniquely made by phytoplankton, as well as a type of phospholipid that is produced predominantly by heterotrophic bacteria. After determining relationships such as these, a final step is measuring how quickly these lipids are produced to see how fast the organisms are growing. Faster lipid production means more membranes are being made, which means more growth. By measuring how quickly the phospholipid I found is made, for example, I can see how quickly the heterotrophic bacteria are growing and how quickly they are recycling material in the surface ocean. In nature, carbon is a major currency that makes the world go around, in infinite biochemical transactions conducted by infinitesimal microbes. At present, the details of these biochemical transactions going on in the ocean are still as hard to discern as, say, looking out an airplane to figure out who’s selling and who’s eating how many corn dogs on a Saturday in Memorial Stadium. 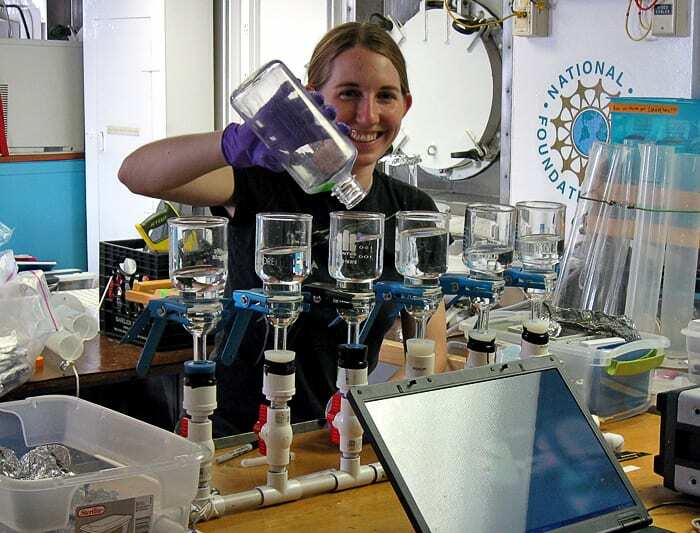 I’m excited to be developing a new tool that can begin to unravel all the critical biochemistry that these microbes are performing in every drop of seawater and helping to understand the role of the ocean in broader processes that affect the Earth. This research was supported by a grant from the National Science Foundation and a National Defense Science and Engineering Graduate Fellowship.